I am the founder of the Square Peg Foundation, where we employ rescue horses (many of them OTTBs) in a therapeutic riding program for kids. People sometimes ask what it takes to get a new horse ready for our program. I was introduced to trick training when trying to figure out how to keep some of our horses from developing neurotic habits like stall walking, weaving and cribbing while rehabbing from racing injuries. I had no idea how quickly they could learn. 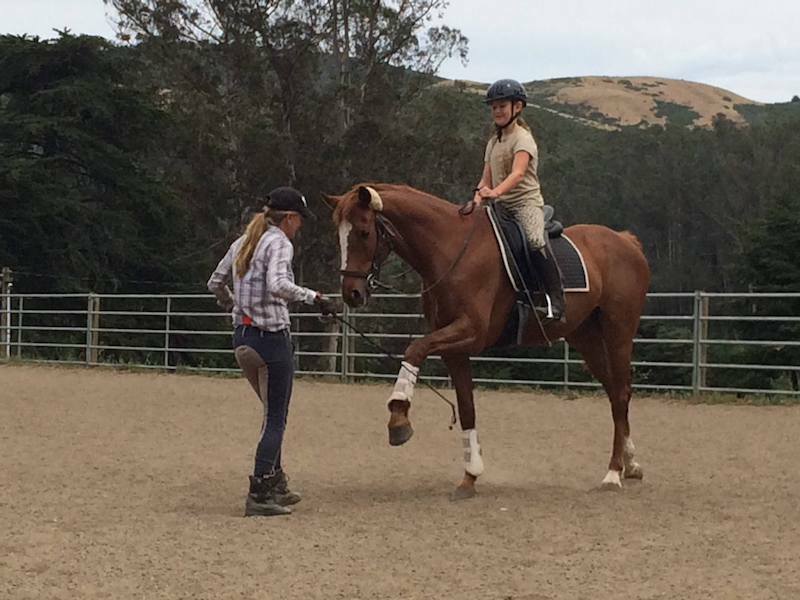 More importantly, I didn't know how much trick training could move the under-saddle training along so smoothly. I know, I know – you've seen horses that are greedy for treats, obnoxious and mouthy. And then there's the nightmare of the horse that someone “taught to rear” that you see on the Internet. But bear with me a minute. If I teach a horse to “smile” on command, I've accomplished a couple of things. The horse and I can enchant kids and adults alike. Let's face it – it's adorable. As a trainer, I can't force a horse to smile. I give a cue and he chooses to respond. Now I've developed a relational dynamic based on a non-forceful ask and a willing response. I've tapped into his willingness to engage. Once these questions receive consistent and eager and engaged answers, we transform those queues to Spanish Walk, to piaffe and to passage. Each of these moves builds flexibility, strength, and coordination. Teaching a horse to step up onto a pedestal comes in handy when he needs to load into a step-up trailer – or if we need to examine or X-ray some part of the horse. I can point to a spot and he will choose to step up onto it with understanding and eagerness to engage. The first and most important task is getting the horse's attention and respect. Without these, all training is suffering and struggle. Now the most important thing to remember if you are using treats as a reward is that your hand goes to the horse's mouth and not the horse's mouth toward your hand. If he nudges you and roots for treats, do your best to keep yourself safe from nipping and ignore it if you can. If he's too pushy, firmly and quietly make the horse back a step away from you and then do not allow him to invade your space until you decide that it's okay. Ideally, you go into his space and not the other way around. Next, get his attention. Make sure he's looking at you. We always start trick training with the words and the intention said out loud “Are you ready (insert horse's name here)?” Soon, he will associate this phrase with something interesting and pleasant (problem solving and treats). In a perfect world, you do this training in a consistent spot. We avoid doing this in the grooming or tying area – we don't need horses offering piaffe in cross ties. Grooming areas are for grooming. Sometimes we do the training in the stall – particularly with a high energy or anxious horse – he may feel much safer in a small and familiar space than out in the riding areas. We begin with teaching the horse to smile. 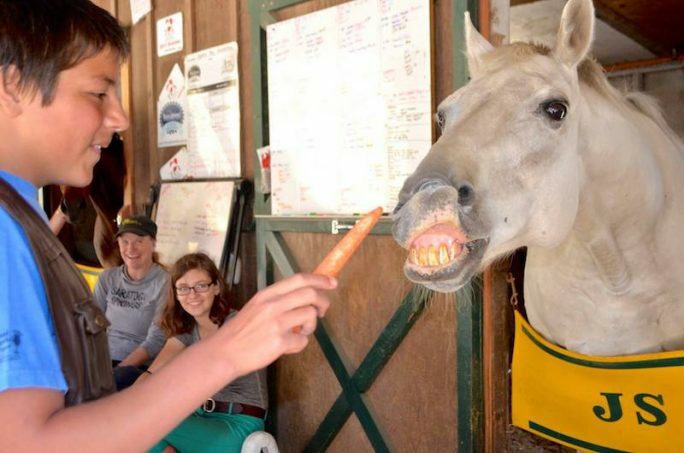 Take a piece of carrot or apple, put it in your hand and begin with “Are you ready?” Then, give the vocal cue of “SMILE!” while flicking your fingers with the treat under the horse's upper lip. Repeat the vocal and the gestural cue until he begins the flehmen response (you can see a picture of that facial expression here). When he flips his upper lip, give an enthusiastic vocal cue, “Good!” and follow with the treat. Don't do more than five or six repetitions without a break of at least a few minutes. This keeps the horse interested and curious. If he gets bored, quit for awhile. Give them plenty of time for the understanding to sink in. Always end on a good note with something easy. Some horses will offer a lot from the very first session, some will take several sessions before they decide that they really want to engage. Be patient and have fun. Play with this simple trick and we will check back in later with some more advanced work. Remember, this is a means to invite your horse to choose to participate with you. Imagine if all of your riding sessions were to begin with you asking your horse “Do you want to dance?” And then seeing him choose freely to do just that. Isn't that the very essence of training? Tricks – not just for kids. Joell Dunlap is the founder of Square Peg Foundation and a registered behavioral technician who has taught hundreds of students to ride. An equestrienne since childhood, she has participated in many different disciplines including racing, polo, hunting, jumping, three-day eventing and reining. Joell has worked professionally in many facets of the equestrian industry including racing, marketing, special events, and breaking and training of young horses, in addition to teaching. This entry was posted in Aftercare Spotlight, Horse Care, NL Article and tagged Aftercare Spotlight, Joell Dunlap, OTTBs, Square Peg Foundation, Thoroughbred aftercare, thoroughbred retirement, trick training by Joell Dunlap. Bookmark the permalink.